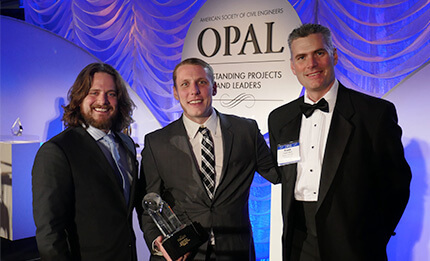 Rutgers professor of civil and environmental engineering Dr. Franklin Moon and his team accepted the Charles Pankow Award for Innovation at ASCE’s annual OPAL Awards Gala in Arlington, Virginia, on March 16. The prize was awarded for Moon’s Targeted Hits for Modal Parameter Estimation and Rating (THMPER™), a portable bridge evaluation tool that combines rapid testing, specially developed software, and a mobile data processing lab. Employing modal impact testing, refined analysis, and calibration of finite element models, THMPER—the first technology of its kind—determines bridge load-ratings faster, more economically, and with less traffic disruption than other current methods. It was created by Moon and collaborators, Intelligent Infrastructure Systems (IIS), Pennoni, and Rutgers CAIT. THMPER’s development began when Moon was at Drexel University, while he also was actively engaged with CAIT on the FHWA Long-Term Bridge Performance (LTBP) Program. Moon joined Rutgers School of Engineering faculty in January 2016. The initial project was funded by a grant from the National Institute for Standards and Technology’s (NIST) Technology Innovation Program (TIP). As its name infers, THMPER delivers a concentrated impact to the bridge with a drop weight, which causes the bridge to vibrate. How the bridge responds reveals a lot about its load capacity. 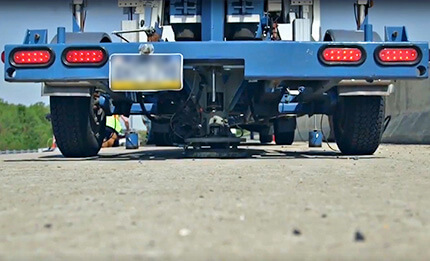 The THMPER impact trailer and sensors, rolling “contol center,” and custom software suite, record the bridge’s response and process test data on the spot. “The impact from THMPER generates a free vibration response in the bridge. It’s somewhat analogous to plucking a guitar string and then recording its distinct vibration profile,” Moon says. “We ‘thump’ the bridge at predetermined, spatially distributed locations and capture the frequency of the vibrations and the shapes the bridge assumes at which frequencies. These data give us key performance measures as to the stiffness and mass of the structure,” Moon explains. 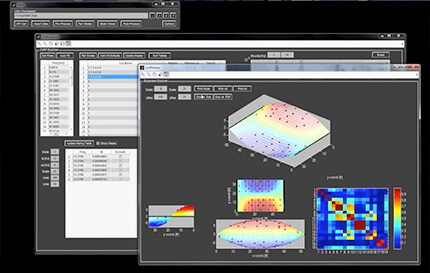 “Sensors record the response, or dynamic signature, of the structure and feed the data directly to technicians in the control van, where the data is processed and used to calibrate a refined finite element (FE) model. The FE model indicates how much load a bridge can safely carry. “THMPER does a really good job at picking up a key aspect of the bridge response in the torsional and so-called butterfly mode, i.e., how the girders share the load transversely. The AASHTO Manual for Bridge Evaluation references all the methods and practices we’re combining here—modal impact testing, refined analysis, and calibration of finite element models—to determine bridge load ratings. “We’re packaging it in a really cost effective and efficient way, but fundamentally it’s not very different than the standards established and accepted by AASHTO,” Moon says. THMPER has been used to assess more than 20 bridges in Delaware, Maryland, New Jersey, and Pennsylvania under pilot programs with federal, state, and local transportation agencies. 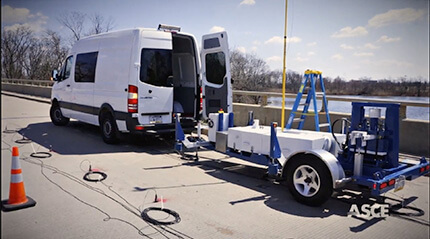 THMPER can test a 100-foot-long, three-lane bridge in about 45 minutes, and evaluate an estimated 300-plus bridges per year at about 25 percent the cost of current testing methods. It provides quantitative data that accurately represents a bridge’s load capacity, and also minimizes traffic disruption. With all of that going for it, THMPER could revolutionize how America’s 600,000+ bridges are regularly assessed, rated, and prioritized for repair or replacement. Dr. Franklin Moon (far right) and team members John Devitis (middle) and Dave Masceri (left) accepted the Pankow Award at ASCEs annual Opal Awards Gala. The THMPER impact trailer and sensors, rolling “contol center,” and custom software suite (top and middle), record the bridge’s response and process test data on the spo (bottom). Faster, cheaper, and with less traffic disruption, it could revolutionize how bridge load ratings are determined.